St. Louis Cardinals take on the Kansas City Royals at Busch Stadium. start of the fifth inning. line), the roundtrip can take a whole half an inning or better. Annoying. had I been in the stands, the fifth inning would have been a good time go. what new excitement my inning would bring. bullpen was on the fritz. They had to send a runner out to give instructions. the day to Rasmus, who was earning his money in center. He plays a sweet and easy center field. A real joy to watch. did hit a double down the left field line. Royals hit thus far, but Olivo hit that exact same double in the second inning. a strike, a curve for a ball and then grounded out sharply to first baseman, Butler. last at bat in the third. good because he might get a pitch to hit. shortstop who threw to first and got the third out. inning for starting pitcher, Kyle Lohse. were balls. Very, very sweet. bat before lining the ball into a glove. inning of solid pitching and defense. In particular, when the Cardinals are enjoying the lead. these UCB sites to continue on with game. Just under two weeks ago, I saw shortstop Tyler Greene play in Oklahoma City for the Triple-A Memphis Redbirds. I liked what I saw. With Cardinals starting shortstop Khalil Greene’s ailing arm and the backup shortstop, Brendan Ryan headed to the DL with a hurt hammy, Tyler Greene got the callup. In his Major League debut in the Cardinals game against the Nationals on Thursday, he got his first big league start. His first big league at bat ended in a strikeout. He followed that with his first major league ground out, his first major league popup and his second major league ground out. It looked like his first start would be rather uneventful, until he came to the plate in the ninth with the bases loaded in a close game. No, he did not hit a grand slam. He hit a little dribbler up the third base line. The Nationals third baseman could not get to it. Rick Ankiel scored. Greene reached. The shortstop came over to get the ball as the Joe Thurston rounded third. Thurston and the ball reached home plate at simultaneously. The catcher drop the throw. Thurston scored. Tyler Greene stood on first with his first big league single, first big league RBI and a big smile on his face. His first major league single was probably not the well-struck ball he imagined his whole life, but it was very well placed and very productive. Tyler Greene was not done. He helped induce a balk that got him to second. He stole his first major league base to get himself in position at third to score his first big league run on a Brian Barden sacrifice fly. I love going to watch the Cardinals minor league teams. It gets me excited about the future. It is fun to see a player I liked move up to the next level and have success. 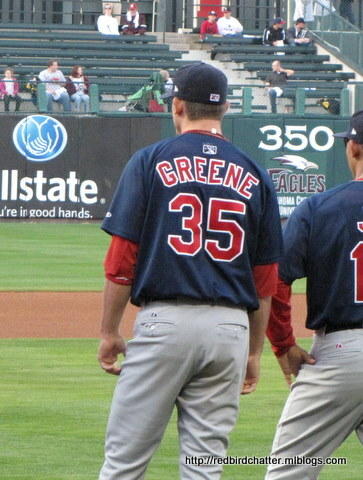 I liked Tyler Greene at Triple-A and I like him at the big leagues. Go Greene! This weekend I will get a couple peeks at the Double-A Springfield Cardinals when they come to Tulsa to play the Rockies affilate, the Tulsa Drillers. Last year, I spotted Allen Craig at AA. I wonder who I will see next?